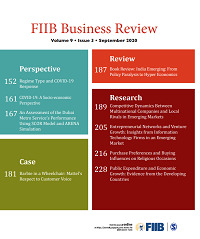 The Editorial Objective of the FIIB Business Review (FBR) is to be the Most Preferred Management Journal which Promotes Applied research in Emergent Themes That Improve the Practice of management. FIIB Business Review (FBR) is a blind, peer-reviewed quarterly journal brought out by the Fortune Institute of International Business (FIIB) for disseminating knowledge and good practice of professional management. It is aimed to serve as a vehicle of communication, between those who study management and those who practice it, by publishing articles that are both research-based and practice-based. FBR seeks to build a knowledge network of management academicians, policy makers and practitioners by establishing a dialogue through articles that provide insightful perspectives on emerging managerial themes, management research of value to professional managers and academics, and management cases on contemporary managerial issues. We are inviting papers to be published in the forthcoming issue of our Journal. Although papers may be related to Research, Perspectives & Reviews; our focus this time is more on the papers related to Case Studies. Select Prof. Dr. Mr. Ms.